"I don't want to look like a weirdo. 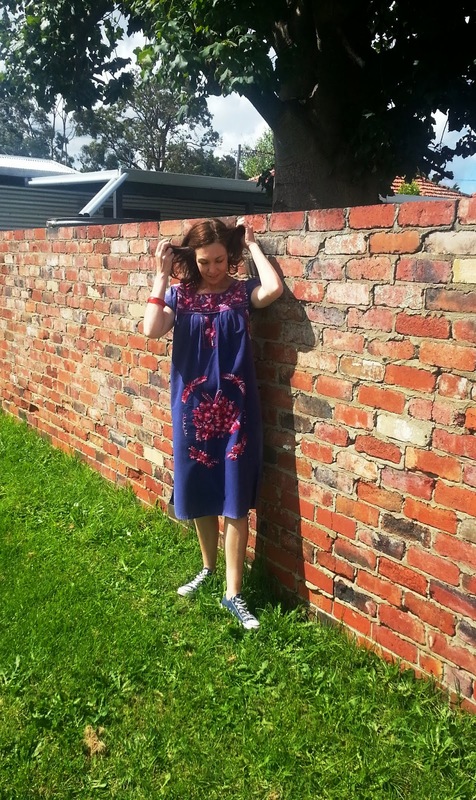 I'll just go with the muumuu"
Today I'm wearing a vintage 1970's Mexican Dress and Cons. I'm a bit iffy on this one...I'm not sure if I should sell it to boost the Frocktober coppers or not. My darling daughters tell me I look pregnant when I wear it (I know I don't look pregnant in these pics, but in the flesh, it does make me look like a frumpy bag-lady. I admit that) but it's just so damn comfortable and easy to wear! Frumpy or comfy? What's a girl to do? I just wish it looked more Miu Miu, than moo moo! At the moment the comfort factor has a stronger grip than the f.f. I'll keep you posted if I decide to sell. 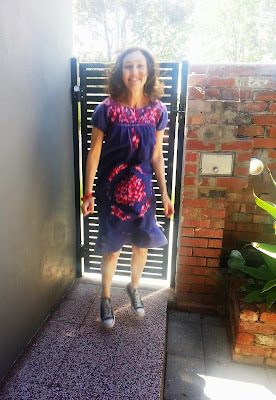 and here's one of me jumping for joy because together we have raised $1310.50 to help fund research into ovarian cancer. Care to throw a few pesos 'my' way too? Julianne and Nelly did. It would be lovely if you could too, just click Here. 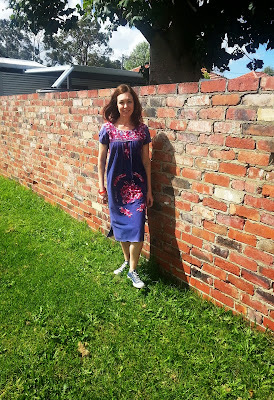 Do not part with this dress! I LOVE it and you look fab and that aside the comfort factor is enough reason. A girls gotta be comfy I reckon. Absolutely don't sell, I sold a genuine 1970's Mexican blouse a few years ago then regretted it ever since. I think you look fab and I love that you mixed it up with some cons. Congrats on your amazing result so far, Kylie, in only 9 days!!! What a lovely thing you're doing! The Mexican dress in so cute. They were really popular here in the late 80s, and my friends and I all wore them. You're right about how comfortable they are. I vote keep! Take care, I´m proud of you and your idea!